Former Owter Zeds mainman John Armstrong brings his new band Wobbly featuring some of the valley’s top musicians to the Trades on Friday 20th November. Wobbly have only been together a few months but have already won a strong following along the valley for their mix of dancey rave, dub-reggae, funk and a bit of rocking soul. 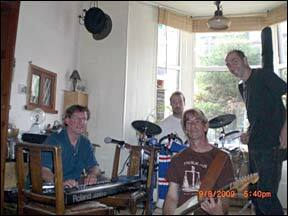 They are something of a local super-group featuring John on keyboards, Moog and vocals, Bones Moore, formerly of the Stuffed Badgers, on space guitar/vocals, Nick Lunn playing bass and former Enid drummer Grant Gilmour. Support comes Northzone’s free styling and world beats as well as a set from DJ Yaka who is one of the Valley’s up and coming disc spinners. “Wobbly haven’t been together very long but they’re attracted a strong and knowledgeable following in a very short space of time which is not that surprising when you consider their pedigree," Trades Club Spokesperson Paul Clarke told the Hebden Bridge Web.